-Calgary is one of the best places I've ever been. NARRATOR: Elk lends a hand to our northern neighbors, as they prepare for a premier international sporting event. -I never thought I'd be able to say, I'm in the international arena at Spruce Meadows, on a horse. NARRATOR: Gets left in a woman's wake on the golf course. But recovers enough to get a little moosey with the locals. Rural Golfer rolls your way next. THEME SONG: 1, 2, 3, fore! We've got the big show revvin', our eyes on the map. Where we're going next, we just can't say. But grab your clubs, let's hit some balls-- we're making friends and playing golf. The Rural Golfer's coming your way. NARRATOR: It's a city of contrasts. STEVE ELKINGTON: Last year was the first time I got to come to Calgary. I fell in love with it immediately. NARRATOR: From its big city cultural scene, brimming with arts and architecture, to the wide open West of horse riders and ranches. -Canadians and Australians are very similar in the way we think and do things. NARRATOR: When you add the area's spectacular scenery, and outdoor adventures, Calgary truly has it all. STEVE ELKINGTON: I got a chance to stay at Spruce Meadows, which is a premier jumping arena. It's just so awesome. -When we first started, it really was to look after having a place where young riders could train and compete. I had two daughters that loved riding. My husband-- he is the man behind this whole project. He dreamed, even after the first year that we had Spruce Meadows, that we'd be international. NARRATOR: It didn't take long for Spruce Meadows to attain global status. And now, 40 years later, it's rich in history and tradition of Olympic caliber. -Golfers collect memorabilia-- this is like real horse memorabilia that's still in action. You know, we saw the Harbor Bridge. -This one here has a special interest to me. This is the Opera House, Sydney. -Oh, that's where it came from. -Yeah, you've heard of it. -The guy who jumped that, and won an Olympic medal. We saw the English Tower Bridge. -And this came from the London Olympics 2012. -This is another gold-medal deal. -Spruce Meadows has really done an unbelievable job of bringing the fans, and the sponsors, and the athletes all together in one venue. -We're open 365 days a year. The gates-- there's no charge to come in and walk around on a non-tournament time. The price hasn't changed since 1975, which was $5 then-- it's still $5. -When the weather's great, it's an unbelievable feeling. A lot of people call it a Camelot. And that's really what it is. MARGARET SOUTHERN: We never ever expected Spruce Meadows to be what it is today. And I do feel really very proud of it. But I don't feel proud of it just for myself-- I really feel proud of it for all of those people that helped us build it. 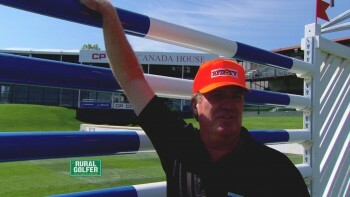 STEVE ELKINGTON: I never thought I would be able to say, I am in the international arena at Spruce Meadows, on a horse. -That's the thing-- on a horse. -He was putting on a brave face. He was the big, butch, brave Aussie that he is. -No, I was not that worried about the horse, because he had a hold of it. -In reality, I think he was terrified. His body type does not lend to an equestrian. You know, he's got quite a bit of upper body bulk, shall we say. -The saddle was too small for me-- I need a bigger saddle. -You know, he's a stout lad. -And they didn't have a horn here for me to hold on to. Well, to say, Jon, that that's intimidating, is to say the least, mate. -Give me a week with him, we'll get him over a jump. -I'm just thankful enough just to be on the horse, in this arena. I'll always be able to say I rode in this arena. No matter what I did or didn't jump, Jon, that's right? -You're going to be in the books. -Look at that-- it's got my name up there, Spruce Meadows, International Ring. This is special treatment today, Jon. 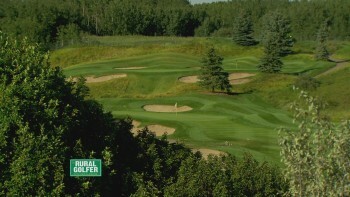 -Having a legend of golf in the international arena of Spruce Meadows, what the heck? NARRATOR: Nestled in the Southern's backyard is a small golf course, overlooking the hollowed grounds of Spruce Meadows. As such, it's a perfect avenue through which the Southern family shares its hospitality. STEVE ELKINGTON: Nobody knows that you have a little hidden course back here? Oh yeah, look at that. Straight at the flag. That was pretty good. How'd it feel? -It felt good, yes. It's not lost. STEVE ELKINGTON: I had a tremendous day today. I got to be on a horse under the clock tower. -No, no, but I felt like I was at Augusta National. You know? -And I got to walk out into the arena, they put my name up on the thing. Very good experience for me. My mother's name is Margaret. -Look at that, I'm a natural. -Now tell us about your moose. LINDA SOUTHERN-HEATHCOTT: So the Moose was a gift when we moved into this place. And we were having a dinner party, and actually, Kevin Costner-- the actor-- said, let's aim for the moose. STEVE ELKINGTON: Oh, so he started it. -So he actually started it, and it's become a tradition at our house, if we have a barbecue. STEVE ELKINGTON: It makes a big noise when you hit it. STEVE ELKINGTON: But hardly anyone hits it. -Course designer. And that's very important, right? -It is critical. Certain holes are going to set up better for your shot, your eye, how you make it. And the same thing on a jumping course. KELLY KOSS-BRIX: You're partnered up with an animal that, actually, you have no idea what they're really thinking or feeling. So it's a huge level of trust that you develop with the horse. -You've got to come through that water, and come around that bush there-- you've got to come here. What are you talking about? -Horses naturally jump over obstacles, and obviously, these horses have been bred over hundreds of years for this actual discipline. -Six feet, roughly, for takeoff. -You're saying that horse can jump from here, for there? -It better be able to. Because it's got to jump bigger at some point, and I need it to carry the width. KELLY KOSS-BRIX: A horse doesn't just jump straight up and down, they have a natural arc. And it's your job to be able to see the distances on your horse to get them to that optimal take-off point, so that you'll be able to clear the jump. You know, when you're actually going up to a jump, you're feeling the rhythm as you go, and you are, as a rider, picks up where you're going to be able to take off. And you make those split second decisions of whether or not to put your leg on and move closer to the jump, or slow down and create more room. -This is the record here at Spruce Meadows, which is 2 meters 12. -This is like bred with a kangaroo. -That's right, usually on the mother's side, it's kangaroo. Sometimes wallaby. -It's poetry in motion. It's beautiful. I never thought I'd say that about horses, but it's absolutely poetry in motion. So I thought I'd come here today and practice my chipping at the famous hill at Spruce Meadows. -Simply put, it is the tallest bank of vertical height in the world. -I really can't imagine how you go round there, you come up on top with your horse. -It sits at five meters. -And then you've got to come down this hill, which is like 38 degrees-- 45 degrees would be right here. And this is 38. JON GARNER: So for the rider, you've really got to understand the impact of the slope on your horse. STEVE ELKINGTON: And then they've got to go over another jump. JON GARNER: And also, where the course designer then goes and puts those jumps, and how you're going to be able to attack it. -If I had to go up there and try to get them, I don't know if I could in the boots. Hey, Jon, now you did this on a horse. -It's steep-- and it's really, really high. Especially when you're on top of a horse, right up top there. JON GARNER: The magnitude of walking up here, especially when you're sitting on top of a horse, and you come around the corner here and you just sat out, looking at this view behind me with-- I mean, you imagine on derby days, this place is absolutely packed to the rafters. It's pretty intimidating. -How did you negotiate this hill? I've seen it on YouTube. -Ian was up top with his coffee cup, he said, here, here. Chip into this. Whoosh, right up, bit lob, right into the coffee cup. -You do a lot of clinics, I see you on Twitter, @lisalongball. That's a good flight, right there. LISA VLOOSWYK: Yeah, I like that. -Talk a little bit about what makes you hit the ball. The tips that you give people. -I am very passionate about growing this game. And I think a lot of people want to add distance, and not just distance for their driver, distance for all their clubs. So I tell women we need to turn. It's so important for women to turn. -Coil, torque, that's exactly what it is. To create coil and torque, you actually have to turn your body. So if you look at this in the top half of your body, and this the lower half, you need to wind up from the top. And so I'm a big fan, Steve, of swing thoughts. We don't need to be too complicated when we get in our kitchen. I like to think, my favorite swing thought is get the middle of your back to the target, or to the middle of the fairway. That's my swing thought. So you want to wind up from the top. You want to unwind from the bottom. -So that first move needs to be that lead hip. You wind up from the top, you need to unwind from the bottom. So that swing thought needs to be, turn the lead hip, turn the lead pocket, turn the belt buckle. Whatever it is that gets you turning. And for power, if you want to hit all your shots a bit longer, not just driver, is you must accelerate through this golf ball. That's why our practice swings can often look just fantastic, because there's no ball there, so we naturally accelerate. As soon as we put that ball there, a lot of people stop swinging at the ball, and that's when we get the chicken wing coming out, or we get the weight onto the back foot-- which again, you're losing 20, 30 yards. -Well, you certainly don't do that. -You haven't got there enough. -You haven't gotten there. You've probably going to hit it-- you sliced the ball to some degree. And you're not going to hit it straight, and it won't be powerful. -What she's working on is very similar to mine-- it's basically the same exact fundamentals. Oh, that's the flight you want. NARRATOR: On a stretch of land just south of Calgary is the pot of gold for every golfer longing for a treasured layout. Pulling life from a coolie, and boasting some of the most spectacular views the Rocky Mountains has to offer, this unique, 18-hole public golf course features a quiet, scenic run, which used to require quarter horses as the means of transportation. -It's link style, and we have about 100 feet of elevation change out here. And you go back and forth through a big natural ravine, which makes for some interesting lies. LISA VLOOSWYK: Here at D'Arcy, you've got big undulations. I'm a fan of the elevated tee box, and elevated greens, and big hills. And you'll get spectacular views of the Rocky Mountains here. So this is definitely a hidden gem, and I just love how there's so many different shots out here. NARRATOR: It's different off the course, as well. This historical property houses a unique dwelling, where Tim, the head golf pro, bravely lives. -It's a big old seven-bedroom haunted house. And when we first moved in, this little old lady showed up at our front door, and she asked if she could come in and see the house. And she sat down and she started crying, and she said, I can hear the boys on the third floor. A lot of funny things have happened in that house. One time, the church bells went off in the house. Like I mean, like loud. People before have seen the ghosts there. I've never actually seen a ghost, but there's a million things. Doesn't bother us. STEVE ELKINGTON: So we're D'Arcy. STEVE ELKINGTON: D'Arcy Ranch, here it is. So we're going to do our three-hole deal. Lisa's a long driver person. -Let's see where that lands. -I'm teeing off first. You know, I've got to hit this fairway-- and in front of Steve Elkington. -She stepped right out onto the first tee, and blew it over a bunker at 290. Well, there's not many people that can do that. -I see mash coming, for some reason. -I'm going to have to step on it. STEVE ELKINGTON: And somehow, I was able to get one to run past her. Oh, can you zoom in up there? That ball is mine-- maybe. There's the-- there it is, right there. -Yeah, no, no-- but look, this was like-- Steve, I literally only got two yards. -World's smallest violin. Not too many ladies are hitting up to here, on this hole. -Yeah, from the tips. Go left just a little. -I'm not going to count off the paces. I'm just going to meet my ball, and play it from here. -[LAUGHS] That's very chivalrous of you, Steve. -Hey, this isn't live clean and place, my friend. -Hey, I'm just wiping the mud off the ball. It's my show. I rarely get beat in these challenges. But we'll see. -That's because you hit shots like that. -Oh. That was a good shot. -That was good. With a hybrid. -I don't like that put at all. -I'll give you that one, for five. -You're going to give that to me? -Yeah, I'll give you that. -Oh, I like that. For a par, I'll take that. OK.
-I've been working on my putting in the bus, so beware. -In the Bis Show. I have a putting green. Can you tell? We'll call it a tie. That stroke that I just hit, that I missed with? That's now out. I made a bit of a mess of my birdie there-- I should have had a birdie and gone one out, but we tied that hole. Then we went to a nice little par three, with a beautiful canyon on the left. It was just awesome. And something happened unreal there. -So unreal, you've got to see what happened. I've got the face-- I've got the face there. I know where that face is. It's there, OK? I'll roll it up. If I feel it-- I'm looking at it. If I had eyes on my fingers, there, I've got the face right there. I've got the face, I've got the face, I've got the face, I've got the face, I've got the face, I've got the face. Face-- and just bam. It just-- bam! On it. And I have that acute awareness of that face. LISA VLOOSWYK: I think you're giving a girl a chance here. STEVE ELKINGTON: Thrown off my game. -Good bounce. That was a good bounce. -Oh, good bounce? Now we're calling it a good bounce! -That's a good roll. Oh! Oh, that's good. I think that's a gimme. This will put me one up. -What? What? What are doing? What's going on here? Was that a flip? That was-- was that a flip? Steve put a great roll on that put, and I thought it was going down. But when he missed it, he opened the door for me. And when my put sunk, I thought come on, bring it on. So I was so excited, I ran and did a round-off back tuck. -So I think I threw him for a loop, which gave me the upper hand. -Dang, that was awesome. OK, so I'm one down. -I don't think I've ever been one down before. Oh, yeah. She means-- she means business. -Oh yeah, I'm not letting you take this, Steve. -I'm still not over the flip. -Oh, the flip was meant to rattle you, actually. -I want you to know that it has. Woo! -I'm coming after you, girl. She's playing me off the men's tee-- so I can't be-- I mean, she beat me from the back. OK, she wasn't on the front tees-- just for the record. She was on the back. So it's doubly embarrassing, if you want to look at it that way. But, hey. -That's a real good shot, there. Look at that. -She was on a downhill lie, and in the rough. And it was about 150. And the pin was cut to the right. Wow-- I might be toast in this match. -OK, here we go, Steve. -It was a stunt-- I think the flip rattled you. That's the only thing that gave me a chance. -I'm telling you right now. -It's the only thing that gave me the chance, was the backflip. -In all the years I've been playing golf, and all the places I've been, nobody's ever going done a flip on me. -See? I knew you wouldn't expect it. That was my secret weapon. I don't mind being broken by a girl. I was fine with getting beat. It was awesome. -I thought he was joking when he was telling us he had a cannon that broke up ice. -Talk about a sonic sound. NARRATOR: He tees it up in the annual McAllister Invitational, hosted by professional golfer, Blaine McAllister, and his brother, Barry. -Everybody tee off are from the blacks. -Elk's coming in at 4 o'clock. -You go pick him up. -Well, I don't want to pick him up, either. NARRATOR: And hunts down some time to hunt a few dove. -Oh yeah, he's not going to shoot right over, cause he missed. -I [INAUDIBLE] shoot right over you.